Life with Miles: To sleep, or not to sleep? Today is Wednesday, which means my mom comes and watches Miles while I go to a yoga class. I am unbelievably thankful to her for this hour and a half of Betsy time. Even though my yoga instructor does not agree with me, I feel like I am back at square one with my practise. I really had gotten pretty far with my yoga poses (pre-baby) but now I'm back to a rounded back in downward dog, falling out of balancing poses and I only last about 3 seconds in my handstands. Oh well, I did take about three months off from yoga,and oh yea, I almost forgot, I did have a c-section, so I have been patient with myself. I just wish I could fit more yoga in, but I do feel pretty lucky to get in my one class a week. John has been dying to get back into yoga, but he's been working so much in the evenings that he hasn't been able to get to a class since Miles was born. He does a good job of at least working on stretches on his own. I am not so diciplined. Wednesdays are also when my Mom 2 Mom group meets up. (It's a support group for new mom's at Dupont Hospital.) I have had conflicting plans for the last few weeks, so I haven't been able to make it to a meeting in a while and today I was hoping to get to one. They are kind of a pain to get to and walking into that room of strangers and their babies always feels a bit like finding a place to sit at lunch on the first day of high school, but I'm always happy after I go. However, just about the time we had to leave, Miles wanted to eat, so instead of going, we nursed at home. He fell into a nice deep sleep afterward and I figured I would take the opportunity to take him out and run some errands. However, I was just dead beat tired. Miles had been up from 3 AM until 4 AM and even though we got back to sleep, I was still dragging. So John encouraged me to take a nap. Everybody always says that women should sleep when their babies sleep, but with dirty floors, laundry piling up or even email or internet shopping, a nap isn't always the taken choice. However, I took John's advice and snuggled up with the pugs for an extremely long nap. (Naps are when I get my pug snuggling time in. It's an added bonus to the sleep!) I felt pretty guilty when I woke up, but I also know that I have to take care of myself, so it was a good thing. Not much else to report today. Miles has been absolultly precious this week and smiling, giggling and cooing up a storm. When we wake up in the morning to go check on him we have been finding him happily playing in his crib, checking out the mirror hanging on the side of the crib or his mobile. This is a much welcomed change from the mornings when he used to wake up wailing. We are trying to help him get interested in rolling over, but he really isn't interested in it. 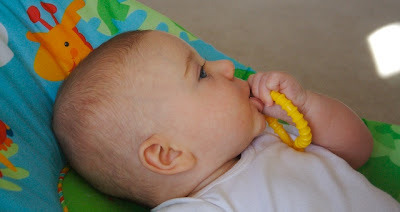 The big thing he's into now is holding on to things and putting them in his mouth. That's it for now. I'm headed off to bed. Nighty night! Can Miles come out and play?